You might think having your car overheat is the exclusive realm of the clunker. Not so! Even modern, well-maintained vehicles can overheat in these hot summer temperatures. Driving up a steep hill on a blistering day or being stuck in stop and go traffic in the heat can get that thermostat climbing. When you see that dashboard temperature indicator begin to rise, start by lessening the load on your engine. Turn off your air conditioning and open up your windows. If the temperature continues to climb, try turning on the heater and the blower, which will transfer heat from the engine area to the passenger area. If stop and go traffic is causing the overheat, avoid riding your brakes, which puts more strain on the engine. While it's tempting to inch your way forward and brake with everyone else, it's easier on the engine if you just idle until the gap between you and the car ahead is big enough to make accelerating worthwhile. If you're already stopped in traffic, try shifting into Neutral and revving the engine a little, which will speed up the water pump and fan to help cool things down. If none of these tricks are working and you're worried you've got an overheating situation on your hands, pull over to the right hand side of the road as soon as it is safe to do so. Pop the hood to let some of the heat out but be careful as there may be steam. Do NOT open with the radiator while the engine is still hot. Wait for things to cool down before taking any further action! Once the engine has completely cooled down, check the coolant level in the radiator or reservoir tank (if your car has a reservoir tank - some only have the radiator). If it's empty or low, fill it with coolant and replace the cap. While you're in there, check for leaks in the cooling system. A cracked hose may be the culprit. If there's no evidence of a leak and the coolant was just low, it may be safe to continue driving once your car has cooled down. Make sure to minimize the risk of overheating by following all of the steps above - air conditioning off, don't ride the brakes and keep an eye on the thermostat. Get your car to a mechanic ASAP to make sure there's no lasting damage to your engine. Has your car overheated this summer? 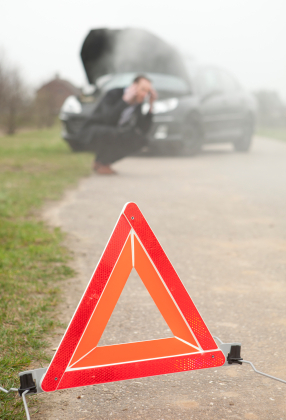 Do you keep coolant in the car as part of your "car emergency kit"? Share your thoughts in the comments! Thanks for all the great info. I wish I'd known all this the last time my car overheated!